Are you a financial officer for your CUPE local? Are you interested in becoming one, and want to improve your math skills? 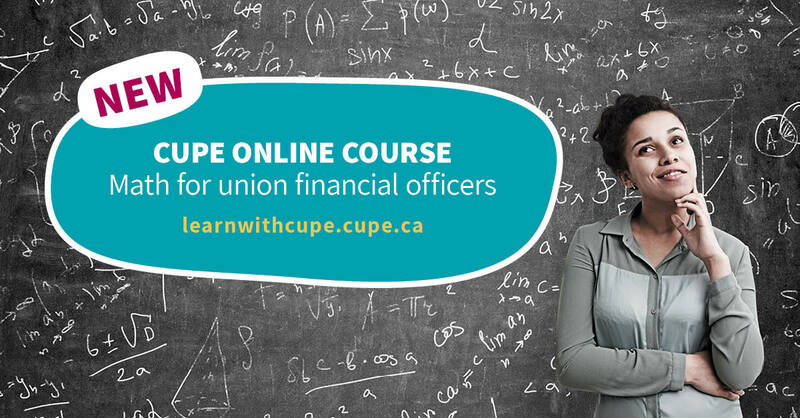 CUPE’s new online math course is for you. Calculating Percentages and Decimals helps you learn how to make basic calculations involving decimals and percentages, union dues and per capita payments. It is a free and open online course. The goal of the course is to help CUPE members and locals build their capacity to address union finances. Sometimes members are interested in union roles that require math skills and they feel the need to brush up. CUPE built this course to help you build your confidence and become more comfortable learning math as you develop leadership and other skills. This short online course can be taken any time, at your own pace. It is open to all CUPE members interested in improving their math skills. CUPE hopes this course helps members learn and grow. We’d love to hear your feedback. You can contact us through the course website.